Chocolate for breakfast sounds like a good idea to me some days. Okay, most days. 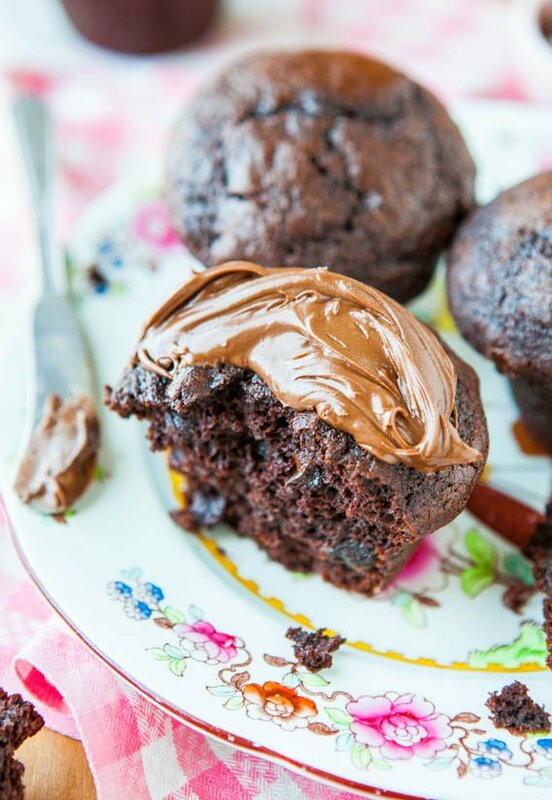 If it sounds like a good idea to you, these muffins are the only excuse you need. They probably could have been called cupcakes, but they’re not as light and fluffy as a chocolate cupcake. They’re denser and have a more muffin-like texture. Since I think of muffins as healthier than cupcakes, I called them muffins. Mind games. They work every time. 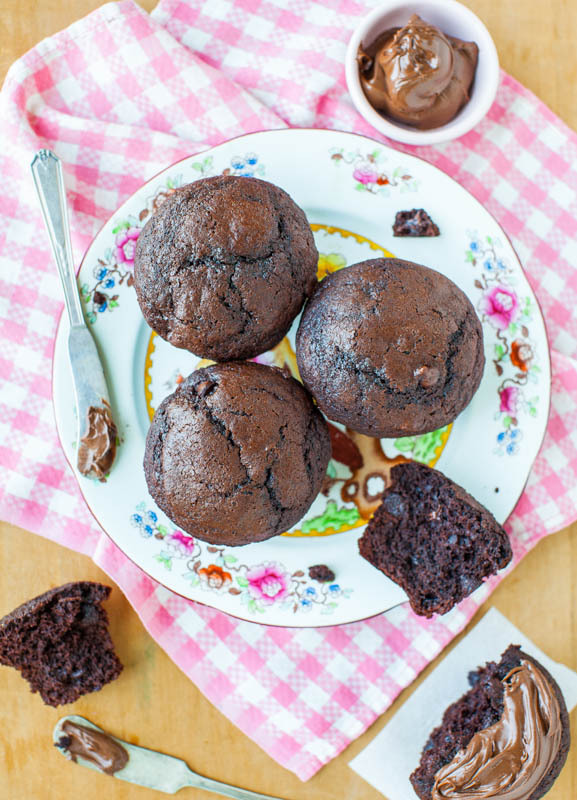 The beauty of the muffins is that they come together in minutes with just two bowls a whisk. No need to drag your mixer out for these big, puffy beauties. They’re ready from start to finish in under a half hour. 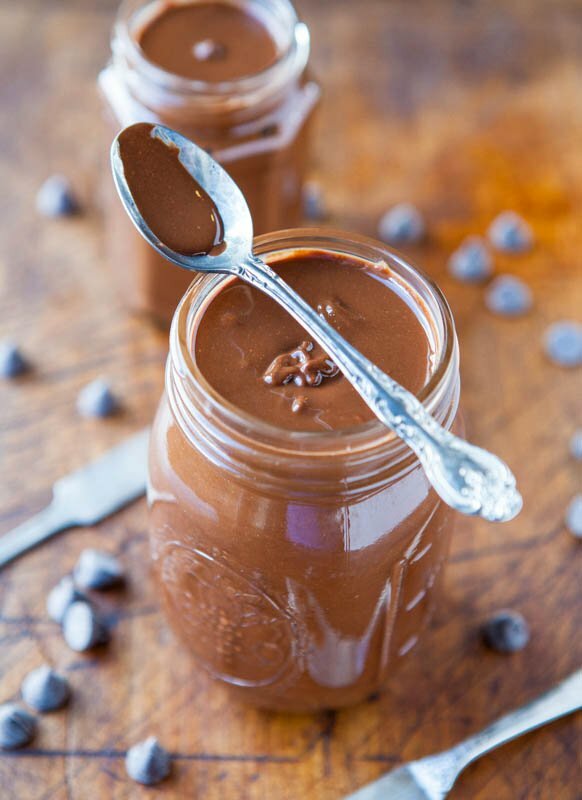 You can even mix the dry ingredients in a bowl at night and the next morning, it’s as easy as pouring wet over dry, stirring, baking, and you’ll be eating chocolate for breakfast before you know it. That’s my idea of waking up. They’re made for chocolate lovers. 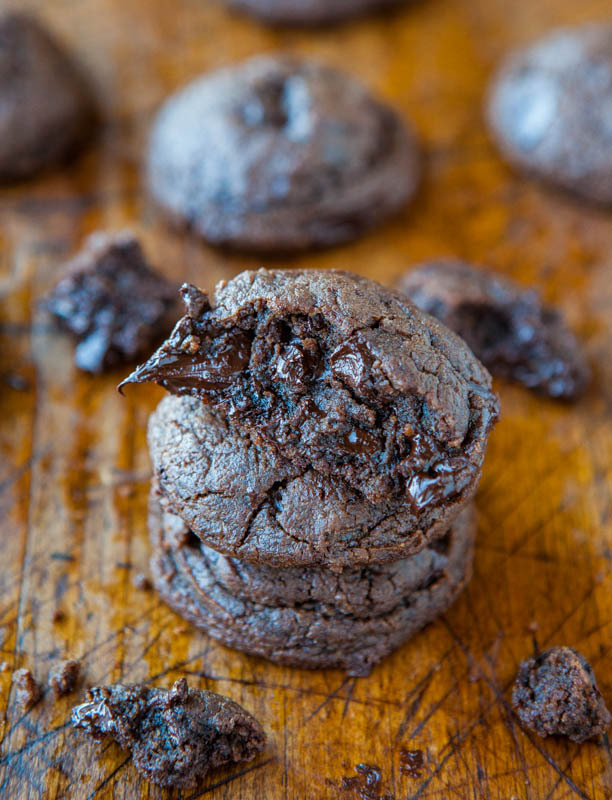 There’s cocoa powder, chocolate chips, and dollops of Nutella onto the muffin tops. 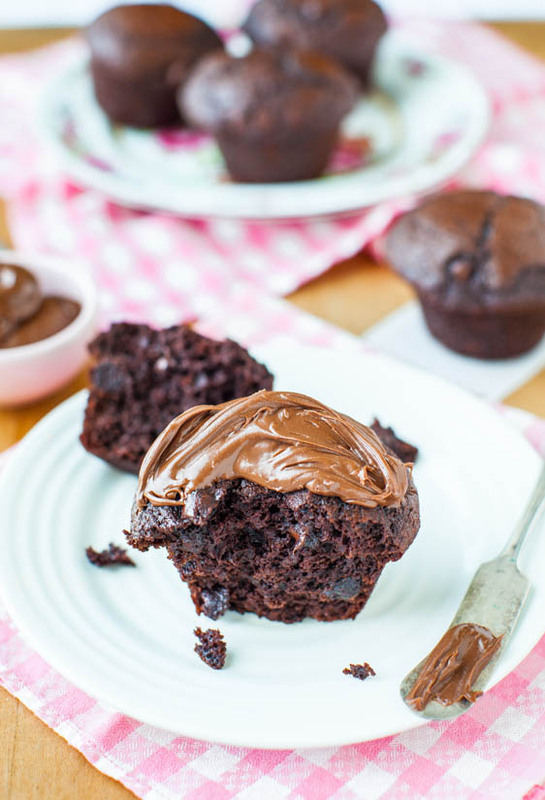 If there’s a way to make a muffintop better, smearing it with Nutella is how. I also smeared some with Chocolate Peanut Butter, since everything is better with homemade (chocolate) peanut butter. Don’t make me choose between Nutella and chocolate peanut butter. 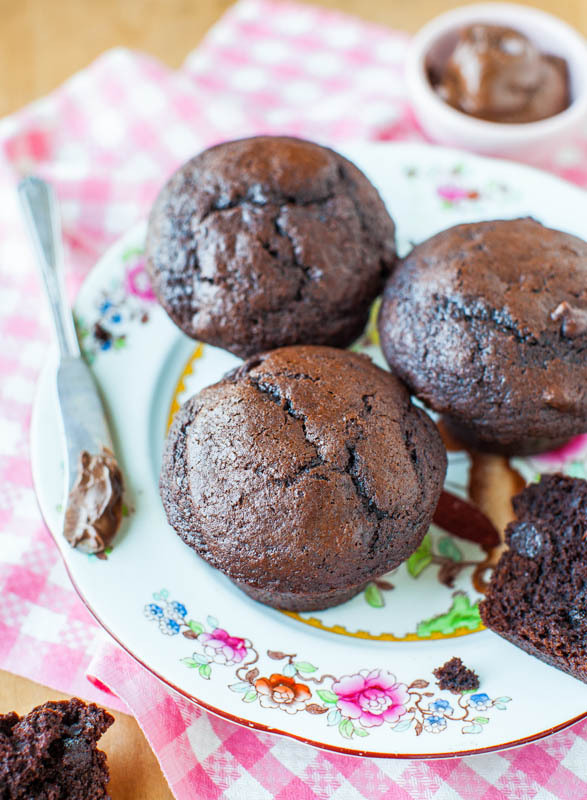 The batter is very fudgy and thicker than your average muffin batter. As you’re combining the wet and dry ingredients, use a rubber spatula and just keep folding and turning the bowl, folding and turning the bowl, making sure to get any dry bits from the bottom, but don’t overmix the batter. The less you mix and develop the gluten, the softer and more tender the muffins will be. And boy, are they ever soft. 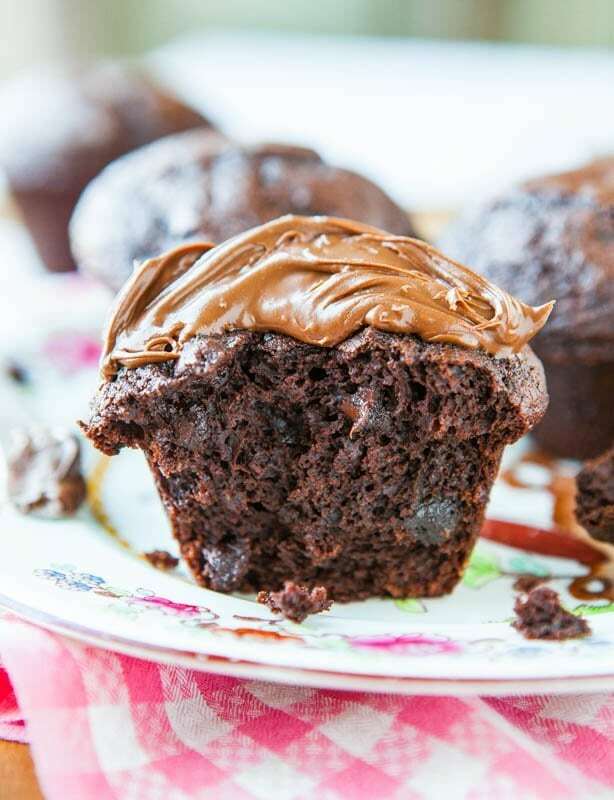 I used oil rather than butter, which I prefer in most muffins, cupcakes, and cakes because it keeps them extra soft and springy. And buttermilk keeps them fluffy, lighter, and moist. If you don’t normally keep buttermilk on hand, you can cheat and make some with vinegar or lemon juice and milk. Or use regular milk and add a hearty dollop of sour cream or Greek yogurt. I didn’t use liners because I didn’t want muffins with ruffled-potato chip marks on them. Instead, I sprayed my pan with floured cooking spray. No issues whatsoever with sticking. When you’re filling the muffin pan, don’t be scared to fill the wells up to nearly the top, a solid three-quarters full. This is what creates big, bakery-style domed-top muffins. 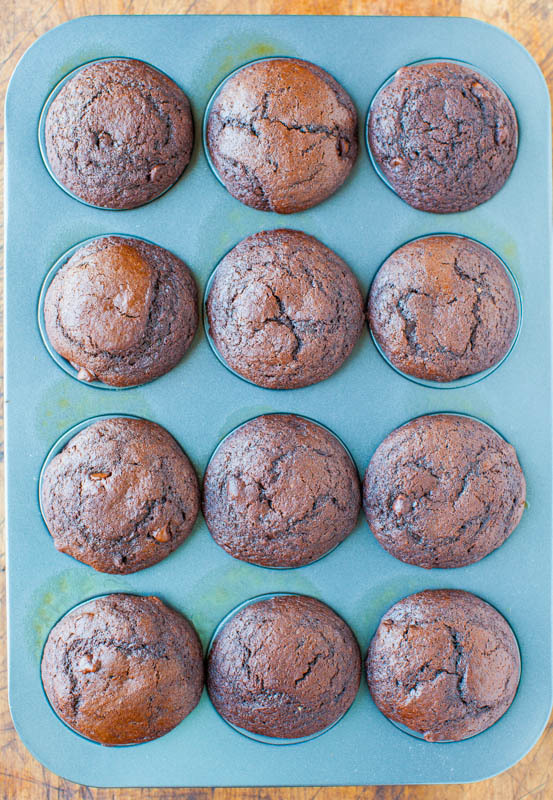 I used a one-quarter cup measure, sprayed with cooking spray, and filled a 12-Cup Muffin Pan perfectly. 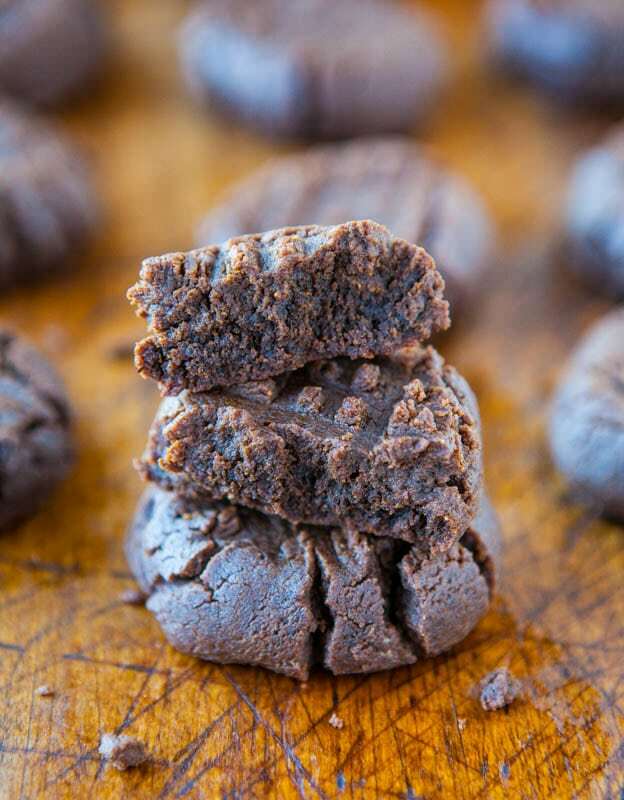 Spraying your scoop with cooking spray helps this thick, rich, super fudgy batter to slither right off and into the muffin pan. In the past, I’ve filled muffin cups up nearly the top, only to create splooging-over mushroom tops, rather than muffin tops, and have ruined plenty of muffins. But with this batter, you’re safe to fill them up very full. 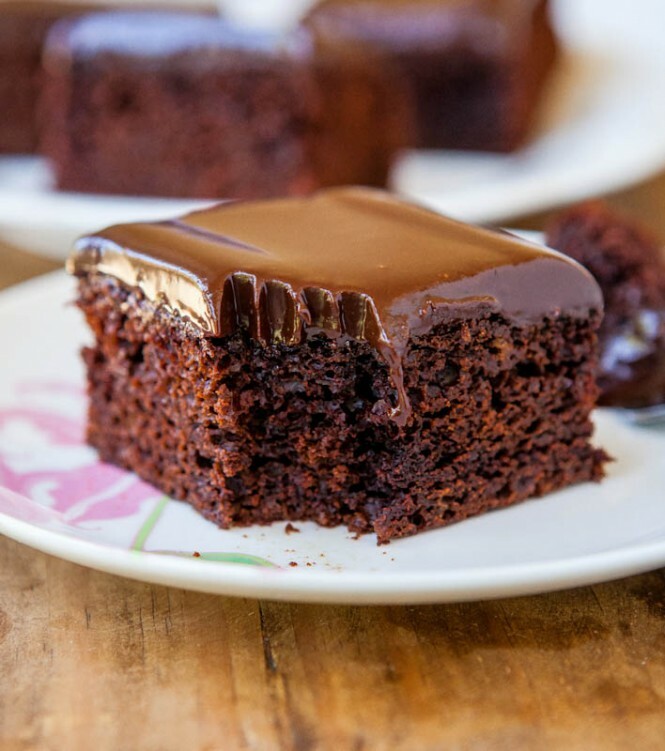 Be careful not to overbake, which is easy to do with chocolate goodies, given the dark color. I baked for 24 minutes and in the future, will probably pull them at about 22 minutes. Watch your muffins, not the clock, when evaluating doneness. 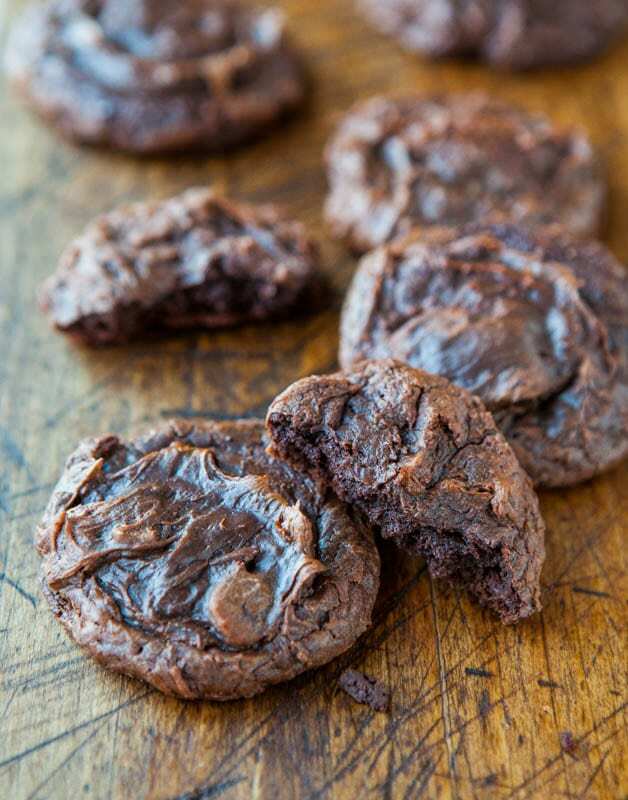 If you happen to overbake, sealing them in a Ziplock overnight while they’re still warm will help them soften up. The outside developed a very slight chewiness and the interior stayed soft, dense enough but still fluffy, and moist. The chocolate chips melted and made them extra chocolaty and rich. When I served them to my family my husband exclaimed, “Oh Wow! Chocolate cupcakes!” I said, well, I’m calling them muffins and explained my logic. He liked my rationale. Then, he told me that I need to give them all away. My heart sank for a minute, thinking he didn’t like them. Call me old-fashioned, but the only two people in the world I really care if they like my cooking are my husband and my daughter. But he said they’re amazingly good and that he was tempted to eat half the batch at once. Chocolate cravings apparently run in our family. 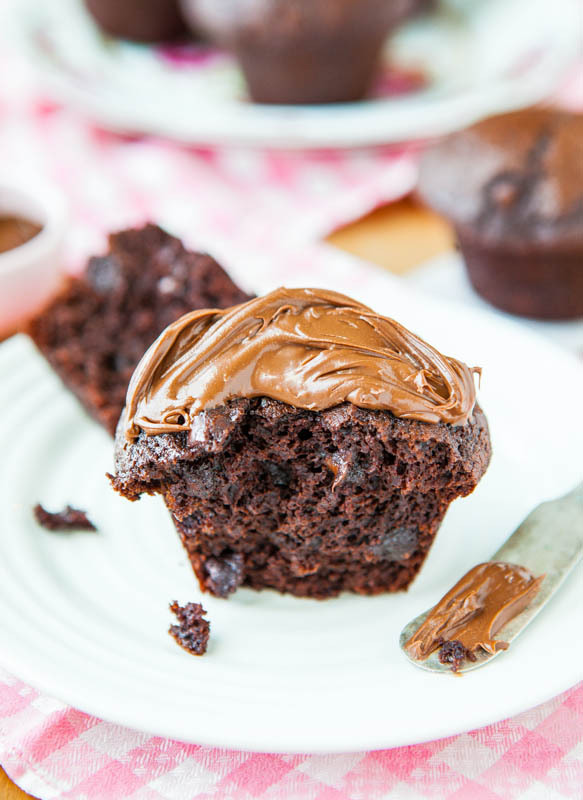 If you like eating chocolate for breakfast, these muffins are for you. 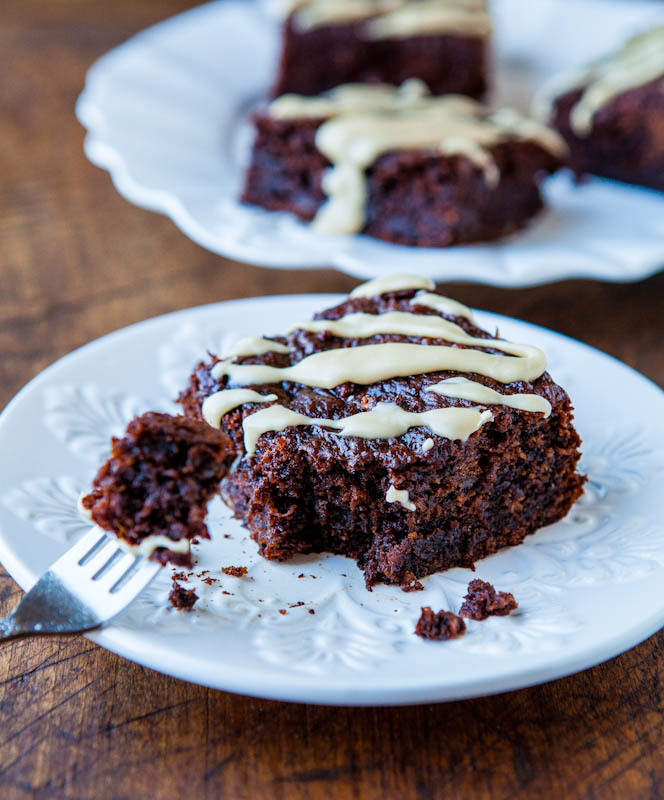 They’re closer in taste to a rich chocolate cupcake, but have the texture of a muffin. 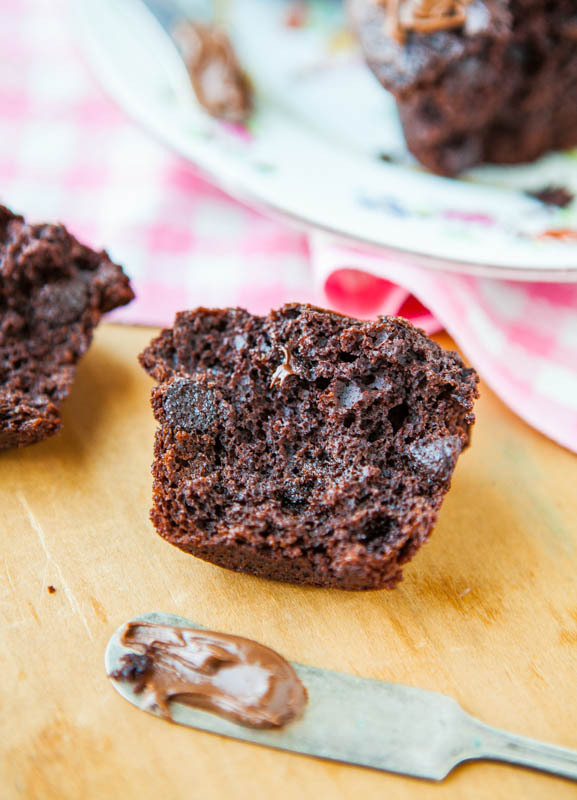 They’re soft, moist, dense, and loaded with plenty of chocolate intensity for chocolate lovers. 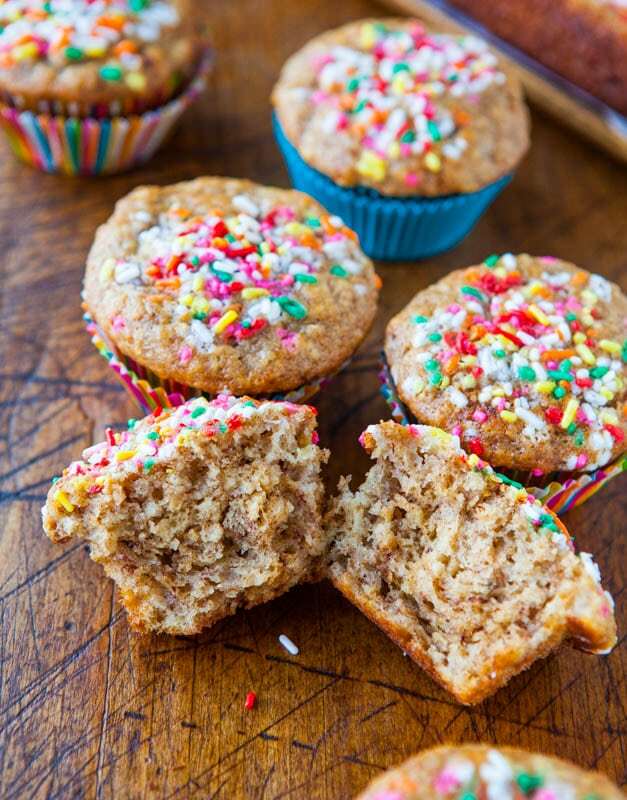 The muffins come together in just minutes, and are ready from start to finish in under a half hour, without needing to use a mixer, which is my kind of breakfast recipe. Preheat oven to 350F. Spray a standard 12-count muffin pan with floured cooking spray, or grease and flour the pan; set aside. For cosmetic reasons, I prefer to avoid the ruffled edges that paper liners create. In a large mixing bowl, whisk together the the first seven dry ingredients, ending with optional salt. Add the chocolate chips and whisk to incorporate; set aside. In a 2-cup measuring cup or medium bowl, whisk together the remaining 5 wet ingredients. Pour the wet ingredients over the dry ingredients and fold to incorporate using a rubber spatula. Don’t stir vigorously or beat; just make sure everything is combined and there are no unblended dry ingredients hiding at the bottom of the bowl or in the folds of the batter. Don’t overmix or muffins will be tough. Batter will be quite thick. Using a 1/4 cup-measure that’s been sprayed with cooking spray (helps batter to slide right out), scoop out quarter-cupfuls of batter into prepared pan. Re-spray measuring cup with cooking spray every third or fourth scoopful of batter, or as necessary. Fill muffin cups up to a solid 3/4-full, nearly filling to the top. This creates domed, high-top muffins. 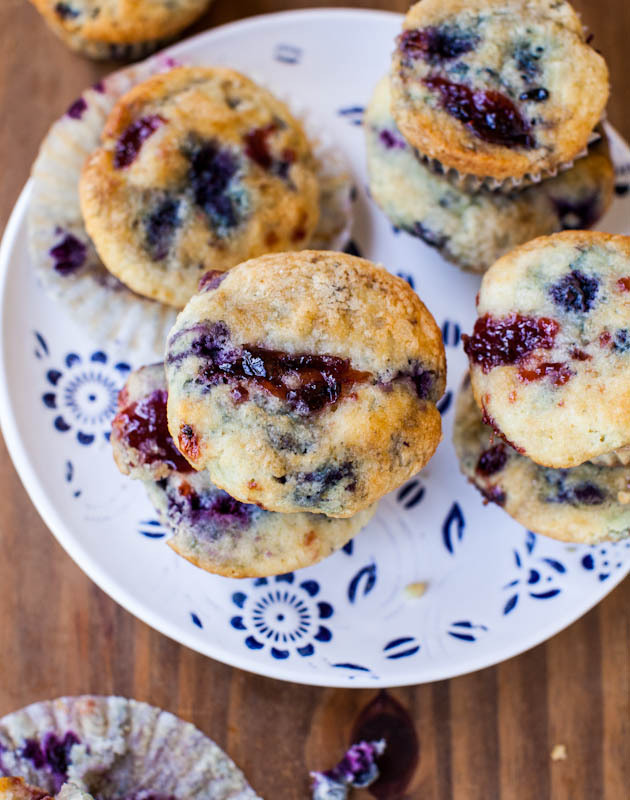 Underfilled cups create flatter muffins, and you’ll also end up with extra batter. 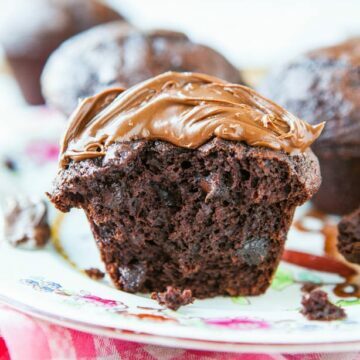 Bake for 20 to 24 minutes, or until a toothpick inserted in the center of a muffin comes out clean (noting that it’s hard to find a ‘clean’ patch to test that doesn’t have melted chocolate chips and it’s easy to confuse muffin batter with a gooey melted chocolate chip). Muffins should be domed and springy to the touch; don’t overbake. 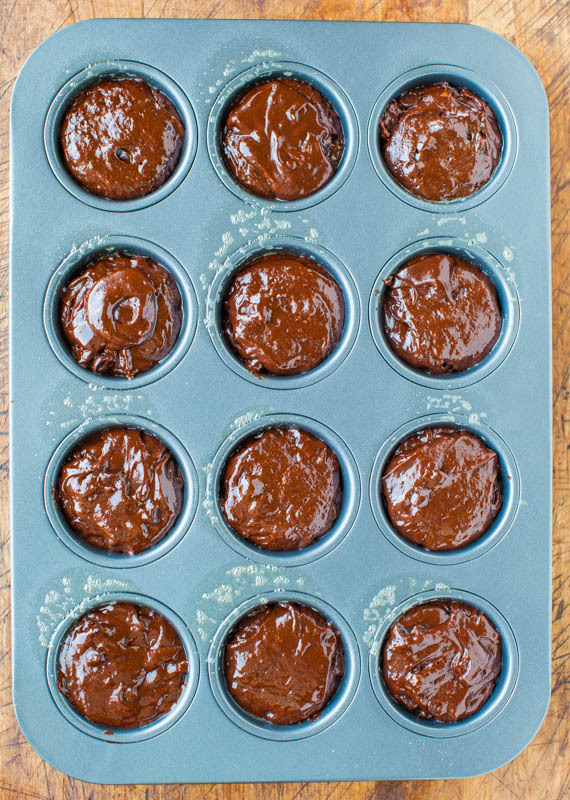 Allow muffins to cool in the pan on top of a wire rack for 5 minutes before removing them from the pan. Then place on a wire rack to cool completely. 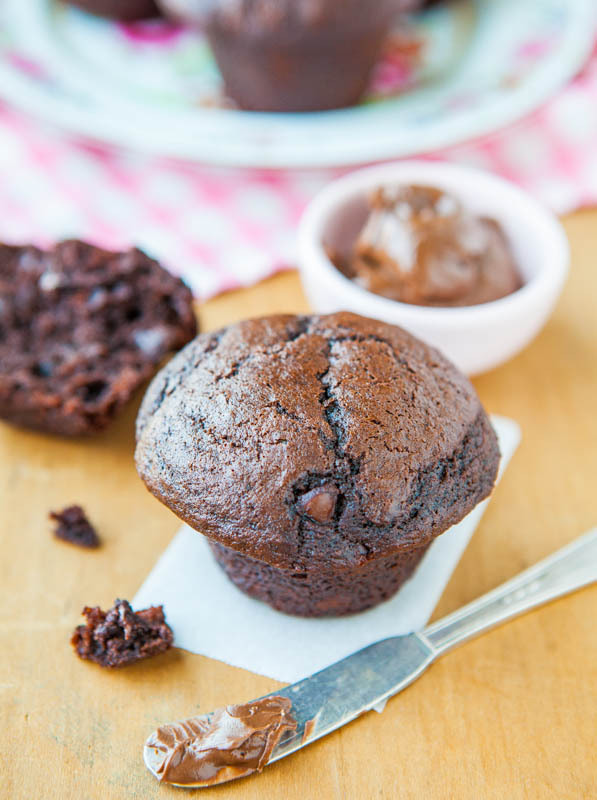 Tip: If you’ve accidentally overbaked your muffins which is easy to do with chocolate, wrapping them while still warm in plasticwrap, and putting them inside a large Ziplock, and sealing it, will help muffins soften over the next day. Muffins are best fresh, but well-wrapped, they will keep airtight at room temperature for up to 5 days, or in the freezer for up to 4 months. 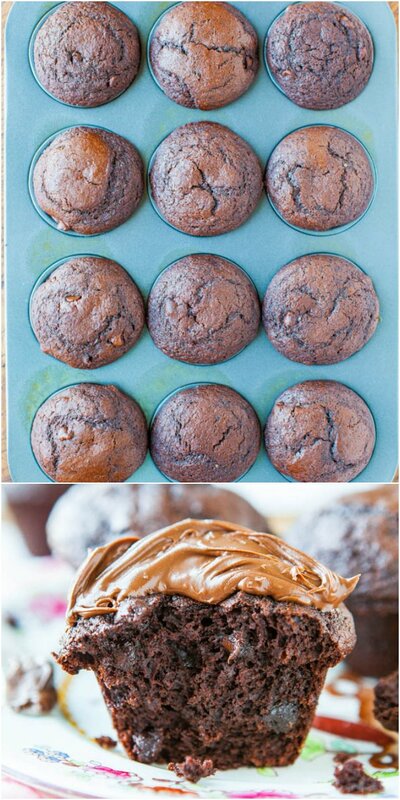 Serve with peanut butter, chocolate peanut butter, Nutella, jam, cream cheese, frosting, or enjoy plain. Thanks for the 20 Healthier Lunch Ideas and Cookbook Giveaway entries. Do you have a favorite muffin recipe? Fan of chocolate for breakfast? Well they are VERY lucky to have you baking these for them and I’m sure they’ll be a hit! Thanks for commenting, even though you normally don’t! So glad these worked out great for you! Having hard time finding espresso powder.How could I replace it? It’s sold in the coffee section of most any grocery store. You could use instant coffee granules or omit if you prefer – but I think it adds so much that I wouldn’t omit. I wonder if you have these measurements in grams? Thought I’d ask before Googling each item in case you already have this info. I made these muffins today but used the wrong cup measure (I live in Australia) & accidentally put in far too much sugar! Hubby & kids didn’t mind, in fact they were rapt as I usually make low sugar everthing. I am a huge fan of buttermilk, always looking for ways to incorporate it into our food, so thanks for the recipe. I’ll be trying it again hopefully with the correct measurements! Thank you so so much for sharing this recipe. The muffins are amazing!! Can’t get over how amazing these are! Every bite was just orgasmic! Thank u once again! I just made these two days ago, and my family just loved them! This is definitely something I will make again. Thank you for sharing this recipe! Thanks for trying the recipe and I’m glad it came out great for you! Glad you’ll make again!